Our vacation this year has been very good in many ways with about 800 M sailing during five weeks. Someone maybe object, that the weather hasn't been worse for ages, but it has been possible to adjust to the rain. The first part of our vacation my wife Berit, my daughter Eva with fiancé Bosse and I together with ours four dogs sailed in freshwater to the town of Granna, where we participated in an agility contest for dogs during a whole week. 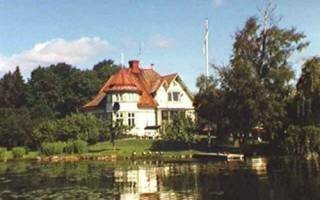 In order to get there we sailed to Goteborg and after that up the river of Gota Alv to my old hometown Vanersborg. Then we crossed the lake Vanern and went into the Gota Channel at Sjotorp. In Karlsborg we left the channel for a long trip down across the lake Vattern. Then we were approx. 50 meters above the sea level. We had passed more than 30 locks in order to get there. After a week of contesting my friend Uno came in my automobile and my daughter, her fiancé and three dogs went home by car. 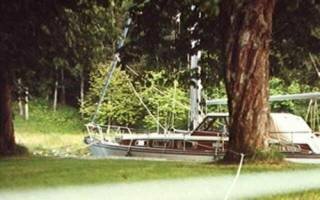 It took them three hours to get home, while Berit, Uno and I had to spend more than a week to reach our homeport. When we got home and Berit started to work, and I went to sea again alone. 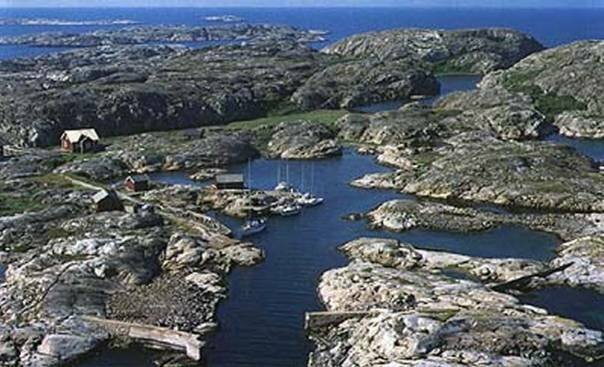 I headed north along the outside of the archipelago of Bohuslan towards Norway, where I visited ours friends in Melsonvika near the town of Tonsberg. I had a week with lovely weather, and I could swim in the sea each morning in salt water. The water was warm (19 degrees C) for the first time this year and there were not too many jellyfishes either. Much better than in the lake Vattern, where the water held just 10 degrees C. But on the other hand you can drink water directly out of lake there. After having loaded the entire crew onboard with equipment for four weeks could we found that, Pia II went a little low in the water. The equipment included among other things an accordion, a guitar and a tent for dog contests. When we sailed away at 16.00 hours the rain stated pouring down, and we went out of Byfjorden by engine. On the fjord Vrangelyckan we set the main sail to support the trip south inside the island of Orust. By nightfall we arrived in Stenungsund, where we moored in the south part of the guest harbor. We had no rain and a lot of wind in the correct direction in the morning. We set the genoa and went down wind south across the Algofjorden to the Insto strait, where we moored at a buoy for lunch. A funny thing was that the current there was so strong, that it drove the boat against the wind, so it was quite windy in the cabin during the entire meal. 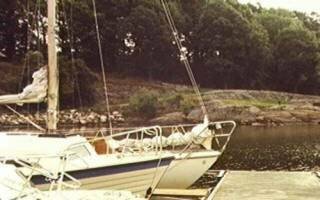 Then we continued on our way through the archipelago of Goteborg at high speed, and since the wind was so strong we took the way inside the island of Bjorko. The approach to the Goteborg harbor was a thriller as usual with waves, high-speed ferries and other kinds of entertainment. When we come into river, we could clearly see that the big city isn't very beautiful from the water. We passed a number of more or less decayed docks and industrial areas. I suppose that the politicians seldom look on their city from that direction. At the fortress of Bohus we went into the river of Nordre Alv and moored at first bridge. It is a beautiful place with nice walks, and we had a barbecue and a good harbor for the night there. By engine up the Gota river in pouring rain. 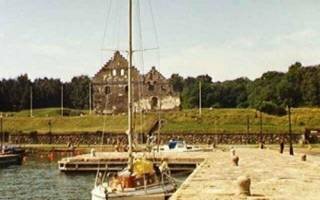 You have got to have a rich internal life to endure the part between Bohus and Lilla Edet. Straight on all of the time and not especially much to look at. 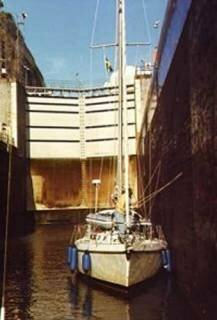 In Lilla Edet you meet the first lock, and the crew get something to do. Then it was nothing more than to steer and listen to the engine again for hours through a somewhat more alternating landscape than before. Suddenly the giant locks in Trollhattan appear before you. It's a whole lot of locks high as houses, and you will not get out of the last one, before you pay the fee of 525 crowns (simple journey). Trollhattan is very beautiful from the river. At Brinkebergskulle we had to pass some locks again, and now we felt that we began to get near our goal that day, Vanersborg. 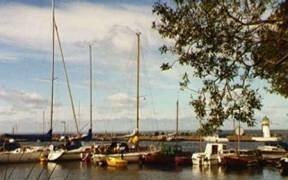 At 21.00 hours we moored in the new guest harbor, that the vanersborgians to the chagrin of many had built in the lake of Vassbotten. My old friend Uno, who lives in that town, came and paid a visit. Before I went to sleep I couldn't help thinking, that we after a journey for three days only were half an hour by car from home. The same way I go to get to work every day. 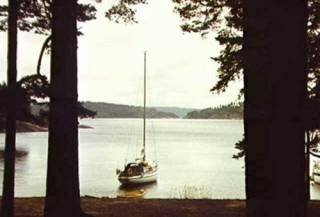 By sail along the shore of lake Vanern to Sikhall, where there Uno has built a cottage all by himself. We moored at a bridge owned by the sail association of Vanersborg near the clubhouse, where I spent so many weekends, when I was young. At Uno's place we had a good shower and a nice rest. We had planned to continue our journey that night, but we stayed on since the wind was against our course and very strong. We had an uncomfortable night there with a lot of tossing and turning and noise from the moorings. Wind in the right direction but strong. We didn't realize how strong it was until we come so far away from the beach that we couldn't turn around. We could only surf along down the giant waves and try to steer at the right course. Pia II runs like a snake on tailwind due to her long keel. 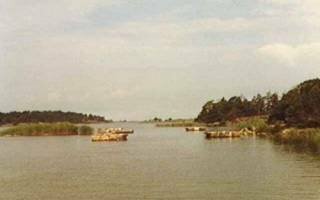 When we had reached the limit of our endurance, the archipelago of Eken with opened up before us with smooth water and green islands. After lunch the crew gathered chantarelles and blueberries. Off again across the bay of Kinneviken, where the wind and waves reached all time high. 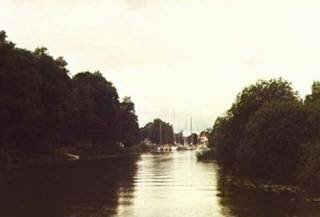 The approach to the town of Mariestad is guarded by a beacon, which looks exactly like a sailboat. For several hours we thought that it was a boat, and we were quite nervous. At the island of Torso was a bridge marked as a ferry in our chart. Was it possible for us to pass under it? Thank God the height was 18 meters. We arrived at last at Sjotorp at 22.00. Of course everything there was closed for the night, so we had to eat boat food that night too. We had sailed 63 M with only the genoa in 10 hours including the break for lunch. 8 knots as average speed? On the next day the weather was fine, and after having paid the channel fee of 1.600 crowns (both ways), we set off along the channel. When we arrived in Toreboda in the afternoon we had a lot of experience of handling the boat in the locks. In Toreboda we were entertained at the guest harbor by local talents, a brass band, and we marched to the center of the village, which was surprisingly urban looking. We had kebab for supper, because we wanted to stick to the local food traditions. As we felt very well after a long night's sleep, we decided to try covering a very long distance that day. We speeded through the most beautiful parts of the channel and out in the lake Vattern. Before that we had anchored in the lake Viken for a swim (14 degrees C in the water). 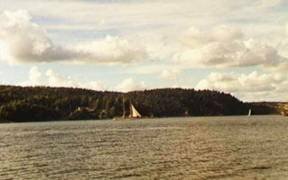 Our plan was to cross Vattern by sail over to the mountain of Omberg and then follow the east shore down to the town of Granna. The wind died outside Karlsborg and we had to start the diesel. The tankmeter was dangerously near reserve from the beginning, but we kept on motoring the entire evening. 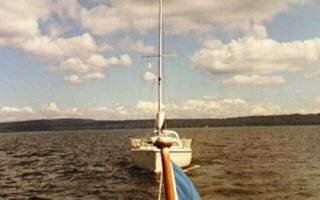 Finally we got to Granna on the last fumes of diesel in the tank, and we were received by the Lundberg family from Sodertalje, who also had arrived in a boat, and they presented a perfect mooring site for our use (as you can see below). The Lundberg had come by the channel too but from the opposite direction (from the Baltic). No seafaring during these days except for two trips to the island of Visingso, but there was a lot of dog contesting and barbecue in the evenings with guitar and accordion together with the Lundbergs. Visingso is lovely, isn't it? Take a look at the picture. The boat club of Granna was extraordinarily accommodating, and they let us borrow their cottage, when the evenings became too rainy. I salute such a friendly club. Eva got a reward for obedience with Nina (the black dog) and our other daughter Anne with her fiancée Lennart, who live nearby in Jonkoping, visited us several times. We had quite a party in a restaurant at my wife's birthday. At noon that day Uno came driving our automobile, and Eva, Bosse and all dogs except for Sarah went home to Hasslerod. 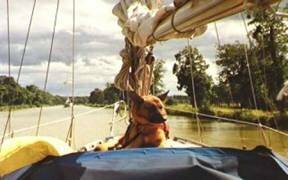 Berit, Uno and I set sails, while Sarah was watching, and went north out on the lake Vattern. When we had passed the northern peak of Visingso, which reaches out very long into the lake, we could steer for the east shore of the lake. The wind was momentarily very strong, and a lot of thunderstorms lurked in the distance. At 20.30 hours we arrived at Karlsborg, where we found a nice mooring site in front of the bridge along a wooden dock. We hand an evening with barbecue, and we became friends with the crew of a RJ 85. We traveled on in the channel all day, and we passed many beautiful places, like this house with Canadian geese at the lawn. After the village of Forsvik follows an especially nice part of the channel, where you can't help but wonder how the passenger boats can pass. On another place you can practically pick berries from the boat. I don't want to meet a channel boat there. On the lake Viken we had to tow a boat after us, while the owner tried to change the belt between the engine and the generator. Finally we came to Toreboda. It was good to moor early in the afternoon for one time sake, Sarah thought. Very hot weather in the morning. We got on our way exactly when the channel opened at 09.00 hours. We had to pass a lot of locks, and we saw in the distance all day. When we came to Sjotorp we had to do a little shopping. The minute we had set sails the rain came over us. 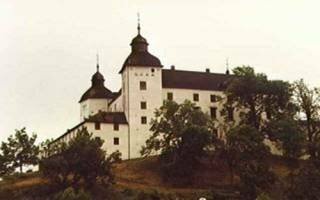 We continued anyhow over the Mariestad fjord and the bay of Kinneviken to the castle of Lacko. Very late in the evening Berit an I took a stroll to the castle to look it over in the darkness, an we were convinced that the count Magnus Gabriel de la Gardie (dead since 300 years) was haunting the place. We thought we saw him in one of the towers. Awful weather. Rain and a lot of wind. Bad odds from the weather report in the morning. We had to go somewhere that day, so we motored away to the very special fishing village of Spiken in the archipelago of Eken. Spiken looks exactly like the fishing-villages of Bohuslan except for the bed of reeds all around it. When we approached the harbor of Spiken we saw that we would be very well entertained there. 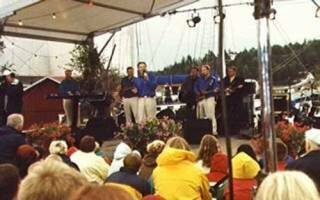 The Swedish TV was there and they prepared a live broadcast with summer entertainment with a popular program leader named Bengt Alsterling. The mission ship Elida was there too. We participated to the best of our ability although the rain didn't stop before the next day. Rain showers in the distance. Side wind out the archipelago (image below). In the afternoon we anchored in the bay of Sikhall after a nice tip over the lake Vanern by sail. Uno's mother waited with onion soup, tobacco and pancakes. We hadn't been able to find tobacco anywhere in the stores along the way for a few days, because the price for a pack of cigarettes was going to be lowered about 10 crowns and the stores didn't like to have a stock bought for the old price. We spent the night in Uno's cottage. Uno woke me up at 04.00 in the morning by shouting that Pia II had run aground. Uno and I rowed the dinghy out in the bay and we saw at once that we had a lot of work ahead of us to get her loose. She had dug her keel deep down in the sand in shallow water, and the wind was blowing right into the bay. First we rowed out the anchor against the wind with a 100-m rope, and then we started the engine, set the mainsail and hanged ourselves out from the shrouds at the lee side. We winched, pulled the main sheet and harassed the engine for two hours, but the poor boat just made a few pathetically leaps forward in the sand into more shallow water. What could we do? I rowed to the harbor of the sail club and woke up a German family at 06.00 in the morning. 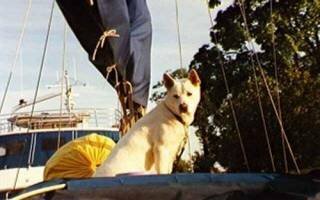 They volunteered at once with their huge motorsailor and a rescue party was on its way. 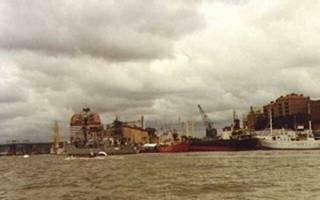 When we were about 50 m from Pia II, I noticed we that she had her bow to the north in stead of south, as it was earlier. Uno, who is a very stubborn man, had managed to pull the bow around through the wind, and the boat took leap after leap out of the sand. There was nothing else to do but to send the Germans back to their bridge and try apologizing for the disturbance in their sleep. Uno and I anchored at the lee side of a little island out in the bay. Then we rowed ashore totally exhausted. Uno and Berit sailed to Vanersborg, while I slept in the cabin. I slept like a log after the terrifying experience in the morning. In harbor of Vanersborg Uno's mother met us with Danish pastries, and I came to life again. We set off along the channel to Trollhattan after having a lot of coffee, and in the evening we moored after the locks (see portrait image) at Akersvass (see landscape image). Akersvass is the lover's lane in Trollhattan. We were delayed at the bridge before Trollhattan for a couple of hours, while it was repaired. Then we found out that it was remote controlled from Kungalv. By engine down the river. The most exciting thing was the landing in Alvangen, where we bought new sheets for our bunks. In the evening we arrived at Bohus, We found a terrific mooring site there at a guest bridge. We had a barbecue in a lovely environment. A couple of old Danes in the boat next to us told us, that they always spend a few some nights in Bohus each year. Out of river through the Goteborg harbor, Where we managed to fill our tank at a rocky barge. Good sailing through the outer archipelago Goteborg and outside the island of Tjorn. 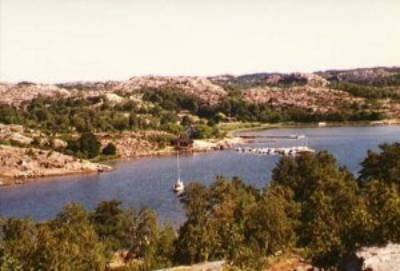 We were not able to find any good natural harbor there, so we had to proceed to the island of Pilgrimmen east of the fishing-village of Gullholmen. It was rather late before we could land that night. The next day we passed over the fjord Ellösefjorden, The Malö Straits and the fjord Koljofjorden led us to Henan, where our son Lars picked up Uno and drove him home in our car. Berit and I proceeded to Hjalton. 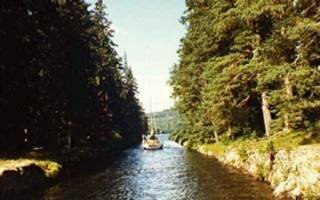 We anchored in the Paradise Bay, rowed ashore and started to gather chantarelles for the supper. We had quite a fiesta on barbecued ribs with fried chantarelles. Gale and rain all through the night, but as usual we had an excellent sleep at Hjalton with no wind and no waves. The sky cleared at lunch time, and the afternoon was spent with swimming and sunbathing at our favorite place. Next day the gale was still blowing outside the bay, but now had to get home anyway. We set the genoa and surfed away homewards. 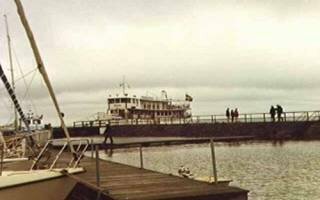 At Vindon Berit insisted in buying cigarettes, and she managed to crush her thumb, when we landed in the rough weather. You should never use your thumb as a fender for a five-ton boat. A couple of days I managed to stay ashore, before I headed north all alone onboard. I had a week vacation left, and I longed for those bald and serene islands in the north part of our county. After provisioning the boat in Henan I cooked a good lunch for myself in the straits of Nordstrommarna, where I was as breathtaking beautiful as always. On the fjord Gullmaren I set full sails and got a fine course past Stange Huvud and the outside of the island Malmon to the bay of the island Lango outside the village of Fisketangen. There I anchored and sat down to watch the rain, which had started pouring down the minute, I had got the anchor in the water. Asa Bodén at the weather service threatened with hard northeasterly wind during the night, but after a certain considering I decided to stay for the night. It turned out to be right, and I had a very calm night's sleep in the inner part of the bay. Still northeasterly wind. Very unusual direction in Bohuslan. Engine through Soten channel and the strait of Tarosund. After that full sails on a course near the wind, that ended outside the sound of Kostersundet several hours later. A couple of times I had to cheat and start the engine, when I passed some narrow passages. I anchored in the east part of the sound. In the morning I rowed ashore and found out, that it wasn't possible to buy ice to the icebox anymore on the Koster islands. Quite a disappointment. Thinking about the extremely high prizes on food in Norway I bought some provisions in the little store on Nordkoster, and sailed off in a light breeze via Kavlingarna towards the Norwegian lighthouse Torbjornskar. At the border (yellow buoy) I set the Norwegian flag in the mast. The Olso fjord was an easy thing and all the way I had course on the island Store Faerder, where I entered the Norwegian archipelago. I passed the sound Vraengen and came into the Tonsberg fjord. At 18.30 I arrived in the Mellsonvika bay, where a free guest bridge waited for me after a trip of 32 M. Our friends Kjeld and Jorunn were very surprised to see me, but they organized a party at once. I was very late that night, so I slept in their guestroom in stead of trying to get down the mountain to the boat unharmed in the darkness. Superb weather in the morning and 19 degrees C in the water! After a long swim and sunbathe I took a little trip to the town of Tonsberg, the oldest town in Norway, and filled the diesel tank at a prize 3,30 Norwegian crowns per liter (twice as expensive in Sweden). In the evening Kjeld and I went for a sailing trip. He sailed the boat all the way and he loved it. It was my birthday present to him. He promised that he and Jorunn soon would come to Uddevalla to visit us. I had to go homewards again. I took the same route by Store Faerder and Torbjornskar to the Koster sound in a very weak wind. Perfect weather, but not for a sailboat. Using all sails and engine it took 6 hours to get back to Koster. I too a swim and watched TV in the evening. During the night I had a violent thunderstorm, and I stayed up to admire it for hours. It was a first-rate entertainment with lightnings all over the sky. Now I headed for Vaderoarna. The wind was very weak, but with engine and sails I wet straight south outside everything. I didn't get on the way until 13.00, and I had a strong current from the south, so I didn't arrive at the sound of Stromsundet on the main island Storon until 17.00. The Log said 24,5 M, while a measuring on the chart said 20 M. Almost an extra hour due to the current. I sailed homewards across Soten fjord early in the morning. At Soteskar a seal appeared couple of meters from boat as I spoke on the cell phone with my colleague in Uddevalla. "A seal", I shouted, and Mats probably thought, that I had gone mad. At Buskaren outside Smogen I anchored for lunch. Weak tailwind homewards, and at 21.30 I reached my homeport after sailing 40 M.
Now the vacation was over and my job waited for me. Fortunately a couple of nice weekends remains in the late summertime. My wife calls autumn, but I regard that word as bad language.